Jesse and Jasmine were rescued as brother and sister and Jasmine was pregnant. 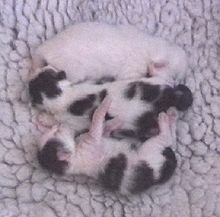 The vet said she was about 6 weeks pregnant but in fact she gave birth to her 3 kittens on Sunday 11th February. 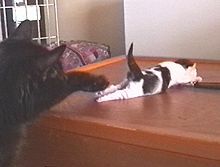 They are all doing well, happily living as a family group and the kittens are beautiful. 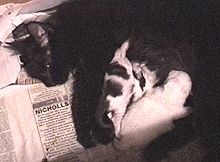 There are two black and white kittens (boy Minou and girl Gemma) and one boy, Milou who is mostly white with a tiny smudge of black on his head. These photos were taken when they were 6 days old, becoming quite mobile around their nest and able to mew loudly if disturbed! Top right: Jesse has Siamese blood, and is quite unconcerned about his nephews/sons/nieces/daughters!! Top right: Gemma has mewed and Jasmine realises a baby is missing. 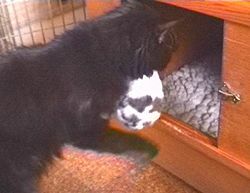 After looking inside the nest, she realises it's one of her kittens crying. She tries to pat her and get her back. Bottom right: Gemma back where she belongs, inside the nest. A little black and white bundle is carried inside! If you would like to give any of our cats or kittens a new home and you live in or near the Croydon area, please call Croydon Cats Protection on 020 8763 0072. You will be home-checked, and we ask for the vaccination costs and a donation to cover our expenses. All cats and kittens are microchipped and in full health, and all adult cats are neutered or spayed. Betsy is a four month old tabby-tortie kitten who has a very determined personality and is not afraid to tell you what she likes and doesn't like. She has been through a lot already in her short life and really deserves to have a home of her own to cherish and care for her, and give her the attention she needs. Betsy was rescued from under a bramble bush with her mother when only a few weeks old. 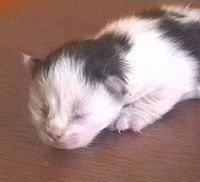 She was an only kitten and her mother did not pay her much attention, doing little more than feed her and keep her clean. Betsy had no littermates to play with and spent much of her time alone under the bramble bush. When she was brought into foster care, she was very passive and would sit wherever she was placed, not moving much, and if wrapped in a blanket would stay like that for ages. She did not play much and her foster mum was concerned that she was undersocialised and becoming backward due to lack of stimulation. Betsy didn't really know how to wash herself properly so this had to be done for her. However there was no problem in the food department and she ate like a horse whenever food was presented to her! She was moved to another foster home where there were young kittens so she could watch them run about and perhaps be brought out of herself a bit, and she did start to show interest in their lively play. It became apparent that her vision was poor although her hearing was very sensitive to compensate for this. Over time her sight has improved and she can now see well enough to gallop around the house with only the occasional bump! Her movements were very hesitant and slow at first, but with time and exercise she now runs about very quickly, although she cannot jump up or down. She has been examined several times by our vets and we think she has weak ligaments in her legs which explains why she can't jump, and her legs sometimes end up at funny angles although it is not at all painful for her. This could possibly be helped with surgery at a later date. Betsy has a most endearing personality and loves to be cuddled and played with, licking and chewing on your hand, but equally will growl and hiss when something displeases her, even if her food bowl is not full enough! She can now wash herself all over and comes when called. We are not exactly sure what the cause of her problems is, and several blood tests have not shown anything to be wrong, so we can only conclude that she has suffered some problem when very tiny, perhaps lack of oxygen during birth, or even the mother cat eating something poisonous while pregnant. She is a very slow developer but is making steady progress with her movement and vision, althought she is still rather unco-ordinated and she will never be perfect. The one major hurdle is her litter-training and this is why she needs a very special home. She is litter-trained as long as she is confined to her pen, but if allowed to roam around she forgets to return to her tray, although she will search around when she feels the urge to go and a quick observer can place her back in the pen to avoid puddles or piles! With lots of patience and training, it is possible that Betsy could be litter-trained eventually, but it may take many months. She also has to be kept indoors all the time - she is too vulnerable to be allowed outside unless there is a completely enclosed area where she would be safe. Betsy is a wonderful kitten and very rewarding, as she purrs like an engine and will happily lie in your arms for hours if she is in the mood. It is a joy to see her develop and make progress. Against all expectations, Betsy has got a new and permanent home with a wonderful lady who is prepared to give her all the time and patience she needs. It's a lesson for us all to never give up hope for a kitten which seems to have no hope of thriving or being homed, unless it's actually suffering - give it a chance, give it time and you may have a wonderful reward. "Some of you may remember that this time last year, a plea was made for a home for Betsy, a four-month old ‘special needs’ kitten, who was partially sighted, not able to jump, and only semi-litter trained, but full of character and a wonderful companion. Having been found under a bramble bush and been fostered firstly by Cynthia and then by me and Sheenah for 4 months, we were beginning to think that nobody would ever want to adopt her with all her problems, and she would have to stay in foster care for ever. Well, little did we know it but a miracle was just around the corner, and a lady who saw Betsy’s poster in the shop got in touch and came round to see her. Julie spent 20 minutes on the floor playing and cuddling Betsy and getting a good idea of what she was like, and how demanding she would be, and at the end of it when I tentatively asked her what she thought of Betsy, said there was no question about it, Betsy was coming to live with her. 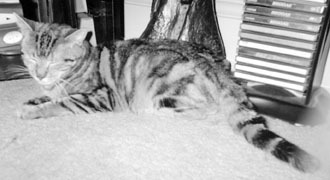 It would be an ideal home, as Julie worked from home and had a large flat, perfect as Betsy was strictly an indoor cat. So a couple of weeks later, after a successful home check had been done, I popped Betsy in her basket (she was always very happy travelling, totally oblivious to any discomfort) gathered up all her things and a pen and we went round to her new home. Julie had already got lots of Betsy’s favourite food and new toys for her, and we set up her pen and introduced her to the litter tray (a futile act, but we had to show willing) and then let her explore. Betsy was quite unfazed by the new surroundings and trotted around, needing little help to master the 5 steps leading up from the bedroom to the hall, and into the living room where food was on offer - a prime attraction as far as she was concerned! I was reassured that she would be fine, and after a cup of tea left them to get to know each other properly. A few weeks later I got a wonderful letter from Julie to let me know how Betsy was settling in and with her permission I have included it here. Betsy has been renamed Betzy as it reflects her rather crazy character better! “Betzy is wonderful, she’s looking bigger to me, so when she goes to be weighed at the vet’s in a couple of weeks I’m hopeful that it will be good news. She refuses to trouble herself with toilet-training but that’s no problem because she mews very predictably and I can scoop her up and off the the ‘loo’. She has learnt to jump down very well and has also mastered the 5 steps in the hallway. She travels really well and has spent 2 weekends away with me, totally unfazed by new surroundings and as curious as any cat would be. However, she has also developed rather dog-like tendencies concerning food and the minute she hears a ‘kitchen’ sound she’s under my feet. She also follows me around like a little dog!! Hmm - what else? She sleeps under the duvet with me, lets me clip her claws, and loves to ‘kill’ the brush when I groom her. I’ve come to the conclusion that her vision is largely peripheral and she uses her right front paw as a white stick. I am trying to get her used to the harness and lead as I’d like to take her on holiday when I go to Ireland in the summer, but she needs a tad more persuasion. What can I say Debbie - she’s adorable! !” In August another letter arrived, along with some great photos. Betzy has been travelling with Julie on holiday, with 2 giant carriers - one for her bed and one for her litter tray, and is quite happy to walk with a harness and lead so she can get a taste of the outdoors, under close supervision. “You will be very surprised to learn that Betzy has a best buddy and it’s a DOG!! I introduced her to a stray that had been brought over from Spain and they are best friends now. I’ve enclosed some photos as they love to play together and share their food bowls, it really is lovely to see! In general Betzy is fit and well, she hasn’t really cottoned on to the toilet situation but she has a little cry that indicates her need to ‘go’, we still have a few puddles but well, what the Hell!! She has a healthy and voracious appetite and seems to prefer dog and people food to her kitten packs. I’ve kept her on a mix of kitten and adult food because she still looks a tad small for her age. She most certainly has character and courage too! She enjoys time out in the garden with the dog and me so long as it’s quiet and hot; she’s not so keen on windy or wet weather! Most nights she curls up on my bed and sleeps with Luna, the dog. Both my teenagers and myself adore her and she is so much a part of the family now, she really isn’t any trouble to care for, she lets me groom her every other day and I trim her claws about once a fortnight. She has no interest in eating the grass I’ve grown for her but she rather likes to kill a fresh catnip toy. All in all she is a wonderful friend and I am so happy I was able to give her a home. Betsy was rescued with her mother on 20th September 2000. We estimate she was about 5 weeks old at the time. 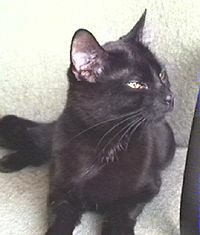 Her mother tested negative for Feline Leukaemia and FIV. Betsy had had numerous tests to investigate her developmental problems. 29th September 2000: Liver Function test showed nothing abnormal. 3rd October 2000: Bile Acid test to test for portohepatic shunt - showed nothing abnormal except very slightly lowered creatine levels. 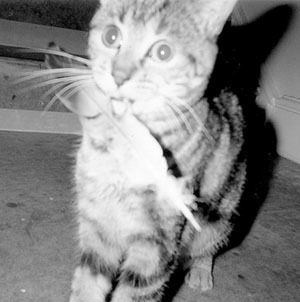 6th November 2000: Toxoplasma test was negative. In January 1996 our group received a call from a lady who had noticed a young stray tortoiseshell cat scavenging in the dustbins for several weeks. It and some other cats were 'owned' by the people living opposite, but they did scarcely more than put scraps out on the back door step occasionally, and didn't let the cats in because they were 'dirty'. The cats had grown up from kittens in this way, semi-strays, were un-neutered, and at feeding time a whole host of cats assembled attracted by food and/or the entire females, of which Katie (left) was one. A CPL volunteer went to look at Katie and found a sorry sight. Her fur was standing out, she was thin as a rake, and worst of all, she had a very sore eye. We took her into foster care straight away. The neighbours never bothered to look for her. Once Katie had been examined by a vet, her eye was worse than it seemed. It was sore because there was a sliver of thorn embedded in the actual eyeball, and the risk of losing the eye was pretty high. Left on her own, she would certainly have lost that eye and have been in great pain. So the vet operated to remove the thorn, and managed to remove all except a microscopic fragment. Katie arrived into my foster care wearing a big Elizabethan collar and with one eye held closed with a stitch. Despite her neglect and the pain her eye must have caused her, she was the sweetest-natured little cat I have had, and loved to be stroked and talked to. But her tummy was very sensitive, due to her previous diet of scraps of human meals and waste from bins, and it took a couple of weeks of boiled fish, chicken and dry IAMS to settle it down. She also had to be gently washed with a damp tissue and brushed as she couldn't have the collar off for one minute, as one single scratch to her eye would mean its permanent damage and loss. What a transformation took place over the next few months. Katie's coat grew really thick and shiny, and one month after the operation, her stitch was removed and a beautiful big green eye opened to match the other one, perfectly healed. She was spayed and vaccinated, and allowed the freedom of the flat until a new permanent home came along. 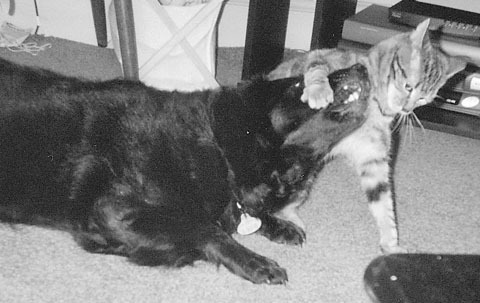 She adored my other cats, and made particular friends with my tabby Willow who would wash her and play with her. I would find Katie in the oddest places, like on the fourth shelf of a bookcase, neatly filed next to the books, or nestled in a too-small box fast asleep; or just as two glowing eyes under the sofa. She talked to you with 'brrps' and squeaks continually - and, not to my surprise, was never once 'dirty' as the owners had claimed. She used her litter tray meticulously and never had any mishaps. The only indication of her previous life was her fear of feet, especially feet with shoes on... you can draw your own conclusions. She was also very jumpy, and would do vertical take-offs surprising any other cat in the area! At last, five-and-a-half months after Katie was taken off the streets, a new home was found for her, in a big flat with a safe garden, and another cat for company.